Wednesday, September 4, 1912: Same as yesterday. Sounds like a slow couple of days in Grandma’s life. I wonder if Grandma’s mother was busy preserving foods for the upcoming winter months while Grandma in school. . . or did she wait until Saturday for major canning projects when she had her daughters home to help. Maybe she made Bread and Butter Pickles. Mix cucumbers, onions, and salt together in a large ceramic bowl or casserole dish. Let stand two hours; drain. In a large pan mix together vinegar, sugar, turmeric, cinnamon, celery seed, and peppers. Bring to a boil. Put in drained cucumbers and onions. Boil for 15 minutes. Jar and seal. Note: Small thinly sliced zucchini or yellow summer squash can be substituted for the cucumbers for excellent pickled squash. I make this recipe almost every summer and they always turn out great. 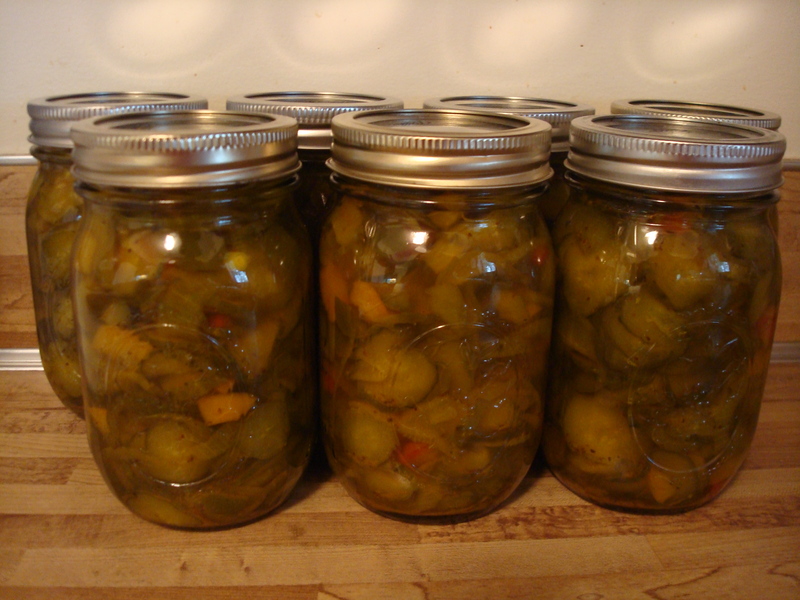 Posted on September 4, 2012 August 23, 2015 by SherylPosted in Food, recipesTagged pickles. I could never separate bread and butter pickles from my mother. The two are inseparable. Thank you for the good memory. Bread and Butter pickles are really good. I remember helping my mom make them. I am pretty sure that she uses an Amish recipe for them, so they probably taste similar. They probably are very similar. Much of the traditional food eaten in Pennsylvania has a strong Pennsylvania Dutch (German) influence. My dad was famous for his dill pickles…boy do I miss him and his pickles. Store bought is not the same. Hoping to get to the farmer’s market this Saturday, maybe they will have some homemade bread and butter and dill pickles!! Do you remember chow-chow? I can’t eat it like I used to but I always get a little to sample every now and then. I haven’t had chow-chow in years. I wasn’t particularly fond of it when I was young, but I bet that I’d really like it now. Hmm. . .maybe I should look for a recipe. . . The first time I saw it I thought to myself I would never like that but after that first taste – yummy! Other than pickles I usually don’t eat anything else that is “pickled”, chow chow is the exception. Hope you enjoy it. I have an Amish cookbook around somewhere around here, I will see if the recipe is in it. I hope you can find the recipe-I’d enjoy trying it. I really like bread and butter pickles. They looks delicious. Bread and butter pickles are the only kind of cucumber pickles that I’ve ever made. I have a vague memory of something called 14-day pickles that I’ve always wanted to try. Another one of your marvelous recipes. What a delight. I can’t eat salt at all but I may try to make them without it. I make garlic dills without salt and don’t miss it much.